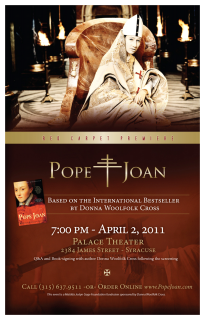 • A chance to meet actress Barbara Rosenblat, the brilliant voice artist who recorded the audiobook edition of Pope Joan. Dubbed "The Meryl Streep" of audio actresses, Barbara has received more awards than any other voice artist in the world. The Recorded Books edition of Pope Joan will be on sale, and Barbara will autograph them for buyers with a personal message. Click here to learn more about Barbara and her extraordinary talent. Purchase online through the Gage Foundation giftshop. • Walk the Red Carpet in "Award Ceremony" style, complete with feather boa (provided! ); an interview with "June and Marissa Rivers"; a posed photo before the movie backdrop for the "paparazzi" who will be clicking away! • Gala Champagne reception before the film, with "Butler Service" tapas and appetizers. And you can bring your champagne right into the theater with you! • A second gala champagne reception following the screening, including scrumptious dessert and festive partying until midnight! Order early, for tickets are limited! • One night's accommodation at the Genesee Grande Hotel, a charming boutique hotel in Syracuse with free parking and/or free shuttle transportation from the airport or train station. $150 per ticket. $250 for two people sharing a room. Book early! Limited tickets available. * This event is a fundraiser for the Matilda Joslyn Gage Foundation. A portion of your ticket price is tax-deductible. Learn more about Matilda Joslyn Gage Foundation. Part of a book reading club or other group? Come as a group and save on regular admission tickets. Packets of 10 tickets cost only $200 ($20 each). Regular admission includes the premiere playbill as well as Donna’s intro to the film and Q&A following the screening. Contact the Gage Foundation Giftshop by phone at (315) 637-9511 for group tickets. Are you a teacher looking to energize your class? While student tickets are only $10 (regular admission is $25 for this special event) we are offering a packet of 10 K-12 student tickets at a price of only $5 per ticket with student IDs. In addition, you can also purchase the new edition of Pope Joan, which includes a list of "Best of the Best" Discussion Questions, at a K-12 student discount price of only $10 ($16.25 if purchased in a bookstore). Or, if purchasing in book packets of 10 or more for classroom use only, you can purchase copies for only $5.00 apiece --a 70% savings over the bookstore price! But purchase early, for the quantity of books that can be sold at this price is limited. All purchases for tickets can be made by FAXING or emailing student IDs with orders to (315-637-9511) (foundation@matildajoslyngage.org). Orders for book packets should be made on school letterhead.